Ever since taking its names from "the metal of the gods" shortly after its discovery in 1791, titanium is an element that has found its way into the creation of superior metallurgy and alloys. Used in everything from professional grade golf clubs to top-secret spy planes, titanium is both lighter and stronger than steel, and is highly resistant to corrosion. 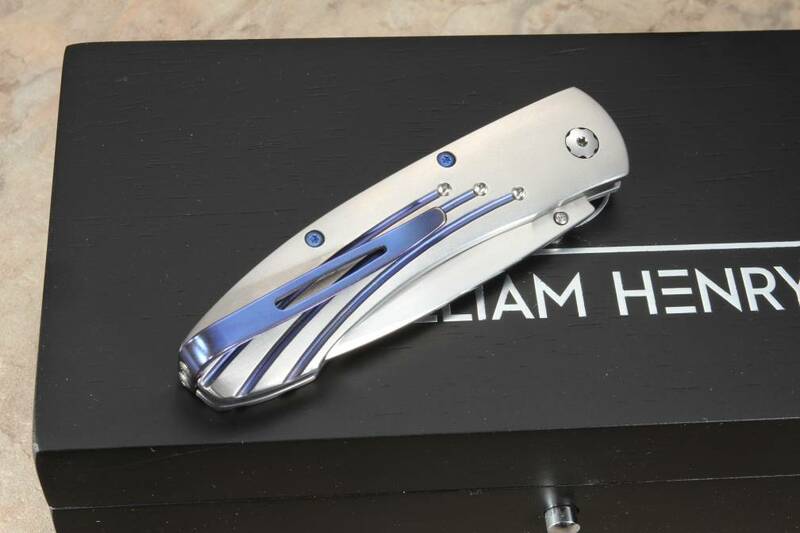 William Henry, a knife-manufacturer world renowned for such knives, both functional and ornamental, brings you the B05 Titan Folding Knife. Crafted from a minimalist, utilitarian design, the B05 Monarch Titan Folding Knife is a testament to strength and function, with an aesthetic worthy of its own display in an art gallery. The 2.63" drop point blade is forged from two different stainless steel alloys, the cutting core of ZDP-169 with a Rockwell hardness of 67, and the softer 420J2 stainless tool steel (HRC of 59-60), which create layers of crystalline structure within the steel, possessing qualities of hardness and suppleness which allow for a strong, yet relatively flexible blade, with the added benefit of being able to take a razor sharp edge and hold it cut after cut. 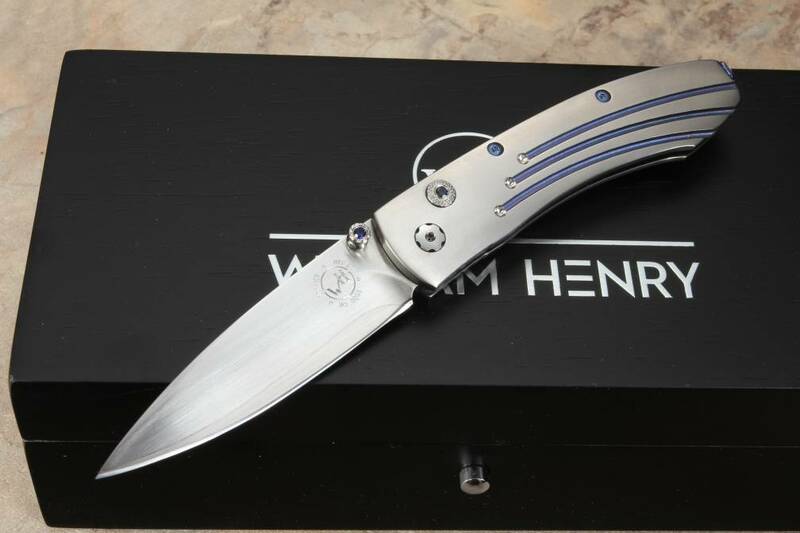 Generally, a no-frills knife, the button lock, and thumb studs are set with a sapphire to match the blue anodized lines in the titanium handle engraving. Integrated into the 3.58" handle is a tip-up blue anodized titanium pocket clip. A one-hand button locking system allows for ease of use and keeps the blade locked in place while extended. With an overall length of 6.00", this blade is lightweight and slim enough for everyday carry use, but strong and sharp enough when medium duty work needs to be done. An ideal gift for the person in your life who has everything, this blade is stunning in its simplicity as well as its practicality. The B05 Monarch Titan is a limited edition of 888 individually numbered knifes. 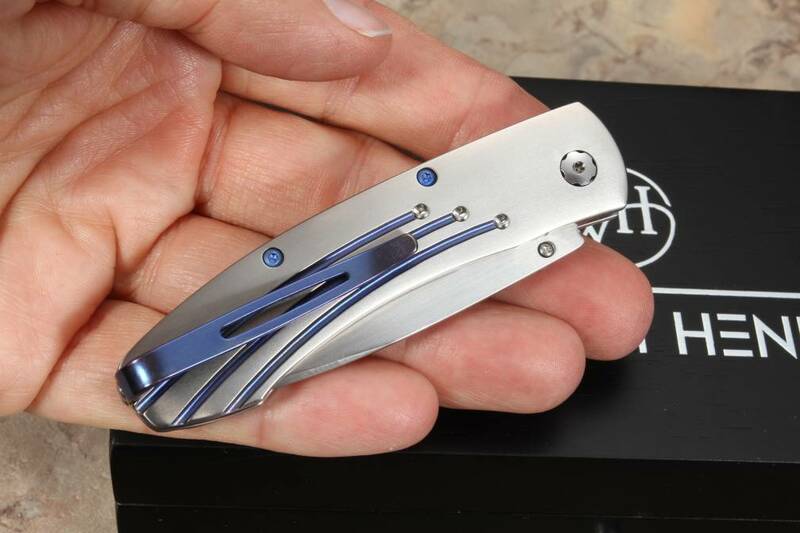 Perfect for the boat, traveling, everyday carry, or displaying in a collection of fine blades, the B05 Monarch Titan is an interesting knife for an interesting person. Each knife is numbered directly onto the blade to ensure authenticity and lifetime traceability. 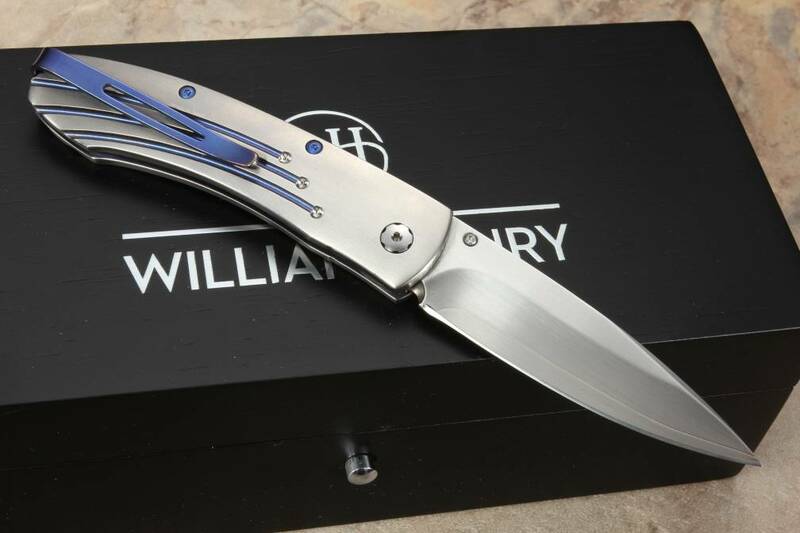 As an authorized dealer of William Henry Knives, knifeart.com provides free shipping, no restocking fees (in the unlikely event you want to return your purchase), and the attention to detail you can expect from curated select merchandise. With over 20 years of experience, we stand by the craftsmanship of our inventory.